Welcome to Day #15 of Chocolate and Hazelnut Theme Week. 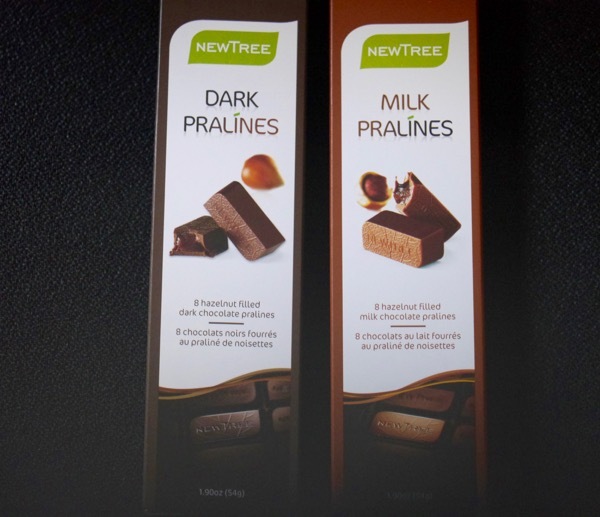 Yesterday I featured Dark Chocolate Hazelnut Pralines from NewTree (Belgium + San Anselmo/San Francisco, CA). And today's I'm featuring the Milk Chocolate version of these same pralines. Like yesterday's dark chocolate pralines, today's milk chocolates were attractively packaged and designed. 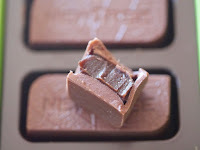 The hazelnut flavor in this milk chocolate confection was very subtle, and the soft filling had a pleasant slight fruitiness, and a faintly boozy flavor note.